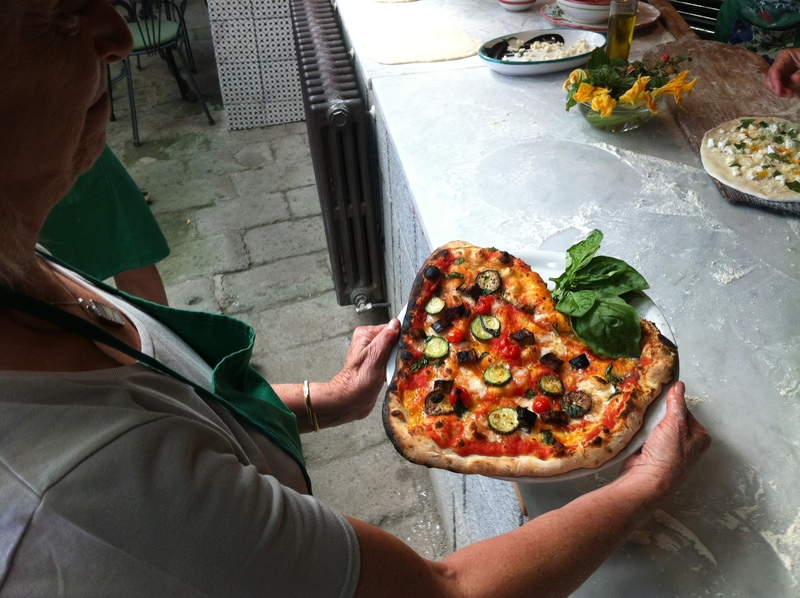 Culinary Discovery Tours – Cooking Master journey traveling through Tuscany | Tuscanyex | TUSCANY Experience - Excursions - Exploring - Expressions - Exclusive - Experts and so Exciting!! We invite you to a full immersion into the principles of the Mediterranean diet, enhancing active daily excursions, slowing down around mealtime, enjoying the conviviality of cooking classes. We book selected Hotel/B&B/HomeRentals on request. DAY 1 Chianti Classico tour, Olive oil and Pizza class After breakfast we venture into the beautiful countryside and enjoy the breathtaking landscapes of vineyards and olive groves that make Chianti so famous. Before lunch we stop at the Pizza Master restaurant, and hands on the dough, we fl atten a perfect ring and bake salty and sweet pizzas at 420 °celsius! After your Pizza lunch, we explore some more countryside and meet Carlo, his two daughters and son at their olive oil mill farmhouse. They are totally sustainable, and produce some of the fi nest cold pressed Tuscan E.v.o. In a beautiful setting, you share the experience of different extra virgin olive oil tastings, including their awarded aromatic specialties. DAY 2 San Gimignano’s Gelato, Saffron, Vernaccia and Pasta dinner After 10 am, we drive to San Gimignano, out of the beaten paths to capture the most eccentric city skyline. Sergio’s Gelato lab is in the middle of the medieval gem. His homey welcome in a sweet freshness of fl avours, makes us ready to follow the Master skills, yearning for that thick, creamy delicacy. We talk about history and art while walking up to Montestaffoli Park. Under the shade of olive trees, some classical tunes of roving musicians is the perfect background for a picnic lunch of local delicacies, tastings the best vernaccia served at the wine association seat. After lunch we visit the art beauties, stock up for traditional crafts, or avoid the crowd, and hike in the lush countryside to the Pasta Class location. By 5 pm everybody take place around the farm kitchen table, and share the cook tips for home mad pastas in pairs with seasonal sauces, and San Gimignano special saffron sauce. DAY 3 Brunello wine exploration, Siena walk and fi nal Siena main course dinner After 9 am we transfer to Montalcino and explore this hill top town surrounded by the most valuable vineyards of Tuscany, producing the world famous Brunello wine. Before 12 pm we move to a family run winery, enthusiast producers of this heaven nectar, for a visit to their cellars, lunch and tasting. It will be hard to leave this moment of grace, Siena will reward us completely walking from the cathedral down to il Campo square embraced by the treasures of medieval art and architecture. Our final delicious prize of the day is the full meal class of traditional recipes. DAY 4 Certaldo and truffle hunt or bread and pastry class After breakfast we enjoy a real truffl e hunt with a master “tartufaio” truffl e hunter, learn about the white and black tuber and why the environment is so important for preparation.